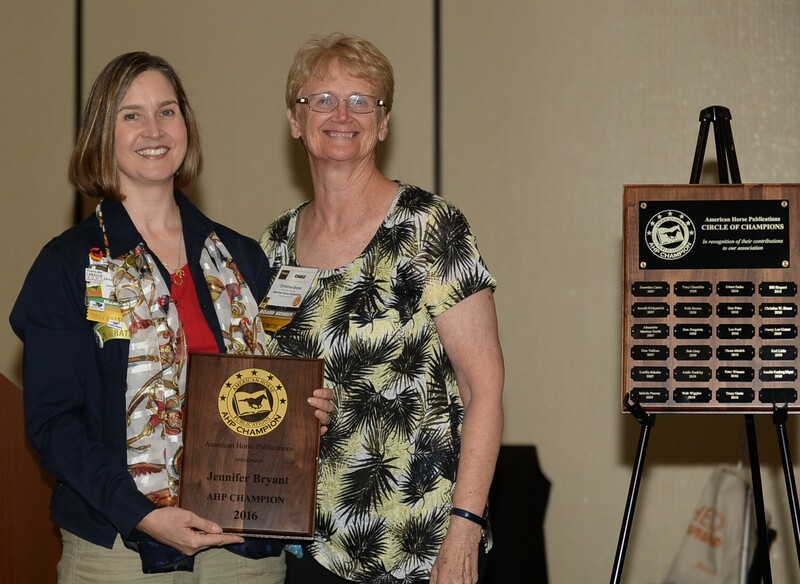 Jennifer Bryant was recognized as the freelancers’ champion at her induction into the AHP Circle of Champions during the AHP annual seminar in Orlando, Florida on June 18, 2016. In 1998, Bryant became a full time freelancer determined to earn a respected career writing about horses. In 2001, she continued her freelance business as editor of USDF Connection, a position she still holds today 15 years later. Bryant is passionate about dressage and has had an opportunity to cover the World Equestrian Games in Kentucky, France and the Olympics in London and Hong Kong. An award-winning editor, writer, author, blogger, and photographer, she identifies with her readers and has built a business for herself as a freelancer. Five years after her first seminar, Bryant joins the AHP board of directors as its first Individual member. Her mission was to encourage others to follow their dreams in equine publishing. During her 9 years on the board, she actively represented the needs of the freelancer and became their voice. As a past president, Bryant continues to support, mentor and encourage. Sometimes her enthusiasm borders on being a zealot with a cause. But it is that determination and a goal that makes her a champion. “She is a template that many others should aspire to,” says Diana De Rosa, AHP 2016-2017 President and an Individual member. Bryant says her proudest AHP accomplishment is seeing the numbers of Individual members grow significantly and AHP becoming broader and more inclusive. A large reason for that is because of one woman’s determination. There is no better champion to AHP freelancers than Jen Bryant. Since 2007, American Horse Publications has honored 37 individuals as AHP Champions. The 2016 AHP Champion Award presentation and a list of past recipients are available at https://www.americanhorsepubs.org/ahp-champion-award/. American Horse Publications was founded in 1970. AHP membership includes equine-related publishing media, professionals, businesses, organizations, and students. For more information, visit our website: www.americanhorsepubs.org.